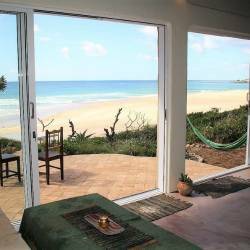 Albatroz Lodge in Tofo nestles on the sand dunes overlooking the sparkling blue waters of Tofo Bay. 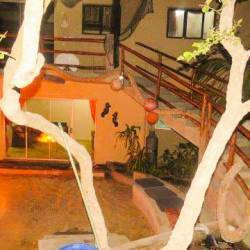 Albatroz Lodge offers self-catering accommodation in thatched chalets. 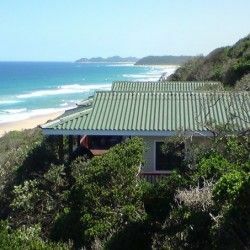 Accommodating up to 8 guests per chalet, the accommodation is rustic and affordable for those visitors to Mozambique looking for budget accommodation with no frills! Each self-catering chalet is equipped with a kitchen, bathroom with shower and outdoor braai (barbeque area). The popular Albatroz restaurant overlooking the pool deck offers a Sunday seafood buffet with a wide variety of fresh delights from the ocean. The fully stocked bar serves cocktails, beer and wine or you may prefer to be served your beverages on the pool deck. Tofo is a small, vibrant coastal resort town with a great swimming beach, numerous bars and restaurants, craft market and a number of diving operators and deep sea fishing charters to keep you busy during your holiday.